Caravel Mystery Books, 9780912887104, 288pp. Fiction. Mystery. 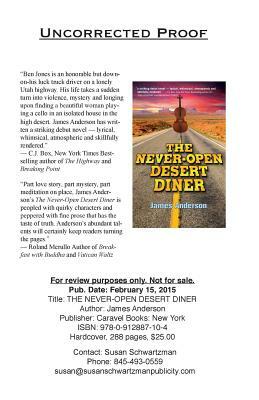 Ben Jones, the protagonist of James Anderson's haunting debut novel, THE NEVER-OPEN DESERT DINER (Caravel Books, 2015), is on the verge of losing his small trucking company. A single, thirty-eight-year-old truck driver, Ben's route takes him back and forth across one of the most desolate and beautiful regions of the Utah desert. The orphan son of a Native American father and a Jewish social worker, Ben is drawn into a love affair with a mysterious woman, Claire, who plays a cello in the model home of an abandoned housing development in the desert. Her appearance, seemingly out of nowhere, reignites a decades-old tragedy at a roadside cafe referred to by the locals as The Never-Open Desert Diner. The owner of the diner, Walt Butterfield, is an embittered and solitary old man who refuses to yield to change after his wife's death.